Diesel Gensets Market Report « Global Market Insights, Inc. The global diesel generators market is poised to witness a remarkable growth curve in the coming years due to inadequate power supply, which is driven by the surge in the demand for continuous and reliable power. Gensets are massively utilized across data centers, transportation and communication systems, pharmaceutical industries, healthcare and manufacturing facilities, and more. In addition, notable investments across construction, mining, and oil & gas sector would further enhance the demand for diesel generators market in the upcoming years. The introduction of several government aided ventures for reinforcing the significant expansion of industrialization and infrastructure, will bolster the diesel generators market growth. For example, the rising real estate construction ventures coupled with the ongoing implementation of smart city projects in India have opened huge market opportunities for the manufacturers of generator sets. Similar to this, the enforcement of the 13th Five-year plan of China has appreciably widened the gensets’ deployment potential across a number of industries. With such initiatives from countries across the globe, it is overt that the diesel generators market share will witness an upsurge in the years to come. Speaking of initiatives, it is vital to mention that governments across the Middle Eastern countries such as the UAE and Saudi Arabia have been undertaking robust moves in a bid to diversify their oil-based economy along with numerous ventures in other industries. The region is also ablaze with a number of massive projects such as the Qatar FIFA World Cup 2022 and the Dubai World Expo 2020 that will quite overtly command the requirement for numerous gensets in order to support the massive construction activities. 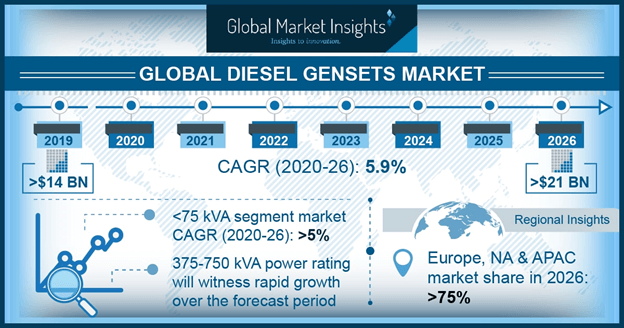 Powered by extensive regional infrastructure expansion and the rising focus on economic diversification, Middle East diesel gensets market is all set to witness quite some growth over 2019-2025. A few days ago, U.S. based Cummins, Inc. was stated to be the first power generator producer to obtain the 2018 International Building Code (IBC) seismic certification, which offers minimum requirements for protecting the public safety, health as well as general welfare of the occupants of existing and new buildings and structures. The IBC certification guarantees that Cummins generators would remain functional and intact during and after seismic activity. This certification is applicable on a range of Cummins’ products, from 2750 kilovolt-amperes (kVA) to 706 kVA within a standby application product offering of 50 hertz (Hz), and products between 2250 kilowatts (kW) and 603 kW within its 60 Hz offering. The IBC also governs standby and emergency power systems utilized in structures and buildings covered by the code. It said that the power systems are required to be designed and constructed to be aligned with the National Fire Protection Association (NFPA) 70 standards. Certifications like these will increase the safety and security factor of the product among customers, which in turn will propel the diesel generators market over 2019-2025. Recently, the Kirloskar Oil Engine Ltd., (KOEL) has introduced a portfolio of its latest products. A range of technologically advanced intelligent diesel generators (DG), known as the i-Green series, was launched by the firm. The product is equipped with a remote control monitoring feature, which would allow monitoring of the set, crossing the barrier of location, along with multiple access of parameters on the control panel via mobile phones. Furthermore, this set would switch off once the grid power is on, and switch on once the grid power is off, as it comes within a built AMF panel. KOEL’s i-Green range guarantees a new look to the gensets, coupled with a commitment from the company towards a greener environment. Such efforts would drive the demand for new and advanced gensets, which will result in the growth of diesel generators market. Considering the aforementioned efforts undertaken by notable industry players, it is clear that the diesel generators market would depict significant growth in the upcoming years. The competitive spectrum of this industry is quite diverse, and consists of renowned companies like Mitsubishi Heavy Industries, Atlas Copco, Ashok Leyland, Generac, Caterpillar, Greaves Cotton, Himoinsa, SDMO, Briggs & Stratton and Wärtsilä among others.. This entry was posted in ENERGY, MINING, OIL AND GAS and tagged Diesel generator, Diesel Gensets Industry, Diesel Gensets Market, Diesel Gensets Market Analysis, Diesel Gensets Market Growth, Diesel Gensets Market Outlook, Diesel Gensets Market Pdf, Diesel Gensets Market Price, Diesel Gensets Market Report, Diesel Gensets Market Share, Diesel Gensets Market Trends, Electrical generators, Global Diesel Gensets Market Size.